An immaculately presented and recently improved bed and breakfast premises, well located within easy walking distance of Betws Y Coed. Llety Betws is a substantial and most attractive Victorian-built house of character c1880, commanding a slightly elevated setting and enjoying extensive views across the Conwy Valley towards Snowdonia. A well established and profitable business offering excellent accommodation with modern en-suite facilities to all 5 bedrooms, with separate one bedroom owner's accommodation, and private car park. Description: - The main benefits include 5 contemporary fitted bedrooms all with modern en-suite facilities; private car park; front terrace with panoramic views; convenient walking distance from the village; private owners quarters and private rear garden area with decking; central heating; uPVC double glazing; fire doors and fire alarm with emergency lighting system throughout. High 4 star grade awarded by Visit Wales. Well-established business and comfortable home in a character Victorian property that has been well maintained and modernised throughout. 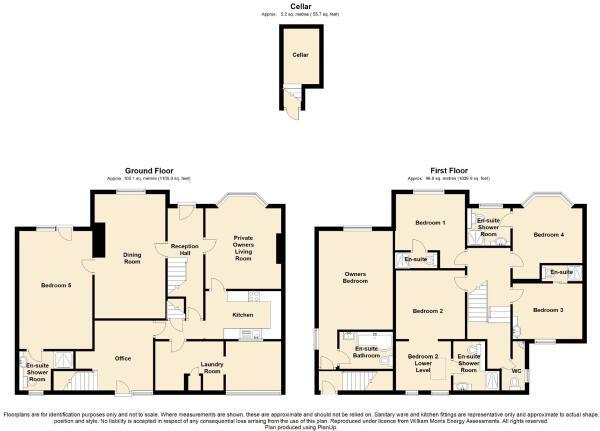 Ground Floor: Reception hallway, owners private sitting room, guest dining room, bedroom 5 (family-side guest bedroom with en-suite and private patio) kitchen, rear laundry room, cellar, private rear office with staircase to owners bedroom with en-suite. First Floor: Bedroom 1, double en-suite, Bedroom 2, family en-suite, Bedroom 3, double en-suite, Bedroom 4, double en-suite, W.C at half landing level, access to large loft area. Betws Y Coed with its mainline railway station, has long enjoyed it's reputation as an established location for exploring the Snowdonia National Park and the whole of North Wales, and there are many castles, steam railways, gardens, coastal areas and other attractions within an hours drive or less. Ideally located in the heart of stunning scenery with mountains, lakes, forest and beaches for those who enjoy everything the great outdoors has to offer from walking, climbing, canoeing, biking and touring etc. Reception Hall: - Original Minton floor tiles; high ceiling with original cornicing; staircase leading to first floor level; double panelled radiator; telephone point; timber and glazed front door; corridor access to laundry room and owners private quarters; doorway leading to kitchen. Private Owners Sitting Room: - 3.49 x 3.76 (11'5" x 12'4") - Large bay window with uPVC double glazing and extensive front views over the valley and village; high ceiling with original cornicing and picture rails; open fireplace with Adam style surround; tiled inset and grate; double panelled radiator; TV aerial socket. Kitchen: - 2.24 x 3.46 (7'4" x 11'4") - Fitted range of base and wall units; split level oven and grill, built-in dishwasher; 1½ bowl sink with geyser above; ceramic hob and extractor hood; original slate floor; granite worktops. Rear Laundry Room: - UPVC double glazed triple window overlooking rear with glazed roof. Space for 2 x washing machines and 2 x tumble driers. Built-in worktops. Shelving. Floor mounted oil central heating boiler. Storage/airing cupboard with hot water tank. Freezer store cupboard and cloaks hanging area. Downstairs Bedroom No 5: - 5.5 x 3.45 (18'1" x 11'4") - Large family-size room with contemporary fitted bedroom furniture. uPVC French windows to front of property offering separate exterior access and private patio area. Double panelled radiator. En-suite shower room contemporary suite with shower, wash basin and W.C. Extractor fan. Wall and floor tiling. Cloakroom: - W.C., wash basin. uPVC double glazed window to side. Extractor fan. Ceramic tiled floor. Landing: - Skylight window, access to extensive roof space, high ceiling with original cornicing. Natural sisal flooring. Bedroom No 1: - 3.3 x 3.48 (10'10" x 11'5") - Double en-suite. uPVC double glazed window overlooking front with panoramic views. Double panelled radiator. Contemporary fitted bedroom furniture & inset wash basin with chrome mixer tap. Shaver point. TV point. En-suite shower room with mains shower, low level W.C., mirror, extractor fan & ceramic tiled floor. Bedroom No 2: - 3.36 x 3.13 plus 2.13 x 2.57 (11'0" x 10'3" plus 7'0" x 8'5") - This bedroom is on a split level with double bedroom at upper level and single bedroom at lower level. Main bedroom area with contemporary fitted bedroom furniture. Picture rail. Double panelled radiator. Step down to single bed area with radiator, velux double glazed window to rear elevation and uPVC double glazed window with woodland/garden view. Wall light. TV point. En-suite shower room - three piece suite comprising low level W.C. With boxed cistern, vanity unit, chrome fittings, mirror above, shower and light point. Shower cubicle with shower, extractor fan; ceramic tiled floor. Bedroom No 3: - 3.38 x 2.6 (11'1" x 8'6") - Double en-suite. Contemporary fitted bedroom furniture with inset wash basin & chrome mixer tap. Double panelled radiator. Bedside units with storage above. TV point. uPVC double glazed window overlooking woodlands & rear garden. Shaver and light point. Sliding door leading to En-suite shower room with mains shower, low level W.C., extractor fan and mirror; ceramic tiled floor. Bedroom No 4: - 3.14 x 4.6 (10'4" x 15'1") - Maximum into bay. Double en-suite. uPVC double glazed bay window overlooking front with panoramic views. Contemporary fitted bedroom furniture. TV point. Double panelled radiator. En-suite shower room with shower with own pump, W.C. Boxed cistern. Vanity unit with inset sink, chrome mixer tap. Double panelled radiator. Shaver and light point, mirror, uPVC double glazed window to front, extractor fan, ceramic tiled floor. Outside: - The property benefits from a private car park with 5 guest parking facilities. Terraced front garden. Flower bed and large patio enjoying panoramic views across the valley and enjoying a sunny aspect. To the rear of the property there is a raised private owners deck, patio area. Well stocked low maintenance garden with original dry stone walls surrounding the property. Services; - Mains electricity, water and drainage are connected to the property. Oil central heating. Please note that none of the services, fittings, fixtures or appliances, heating/plumbing installations or electrical systems have been tested by the Estate Agent and no warranty is given to verify their working ability. Agents Note: - The property currently trades as a Bed and Breakfast property and has a high ranking on Booking.com. Directions: - The property is located just off the A470 on the outskirts of Betws y Coed. From Betws over Waterloo Bridge turn left onto A470 for approximately ½ mile, pass turning for Capel Garmon, then take next right turning a short distance ahead, taking access lane named Lon Muriau leading off the main road to Llety Betws and adjacent properties. Conveniently located within approximately 1 mile walk from the popular village of Betws Y Coed, with its many places to eat and shops. Betws-y-Coed is situated in an area of outstanding natural beauty and where the tributaries of the River Conwy, Llugwy and Lledr meet. The spectacular Swallow Falls and Conwy Falls are nearby. These particulars are intended only as a guide to prospective Purchasers to enable them to decide whether enquiries with a view to taking up negotiations but they are otherwise not intended to be relied upon in any way of for any purpose whatever and accordingly neither their accuracy nor the continued availability of the property is in any way guaranteed and they are furnished on the express understanding that neither the Agents nor the Vendor are to become under any liability or claim in respect of their contents. The Vendor does not hereby make or give or do the Agents nor does the Partner of the Employee of the Agents have any authority as regards the property of otherwise. Any prospective Purchaser or Lessee or other person in any way interested in the property should satisfy himself by inspection or otherwise as to the correctness of each statement contained in these Particulars. In the event of the Agent supplying any further information or expressing any opinion to a prospective Purchaser, whether oral or in writing, such information or expression of option must be treated as given on the same basis as these particulars. Disclaimer - Property reference 26486425. The information displayed about this property comprises a property advertisement. Rightmove.co.uk makes no warranty as to the accuracy or completeness of the advertisement or any linked or associated information, and Rightmove has no control over the content. This property advertisement does not constitute property particulars. The information is provided and maintained by Iwan M Williams, Llanrwst. Please contact the selling agent or developer directly to obtain any information which may be available under the terms of The Energy Performance of Buildings (Certificates and Inspections) (England and Wales) Regulations 2007 or the Home Report if in relation to a residential property in Scotland.